Big news Toronto – DOOMIE’S is opening in early April! A sneaky #whatveganseat slogan was used to keep the Toronto opening of one of LA’s best vegan restaurants a secret. Now, we’re excited to reveal that next month, you and your tastebuds can enjoy the absolute best vegan comfort food available, right at home. 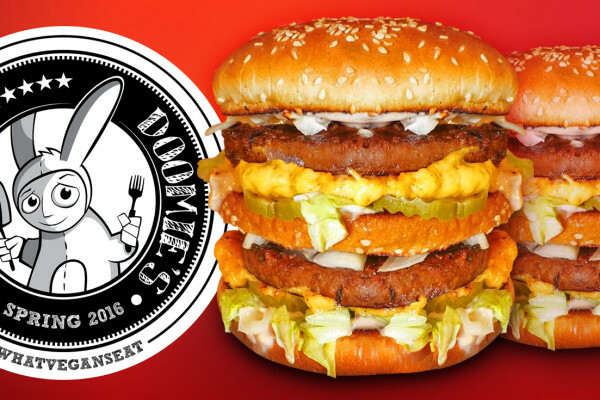 Named one of the best burgers in LA by LAist, DOOMIE’S first left their mark on Toronto when they sold vegan Big Macs at our Vegan Food and Drink Festival in August of 2015. The too-perfect replica, and the two-hour line-ups it provoked, helped cement that although vegans eat all sorts of foods, comfort foods are where it’s at. Now, the Big Mac is just ONE item on the impressive list of options that’ll be served at the Parkdale sit down restaurant. Located at 1263 Queen Street West, diners are going to fall in love with barbecue pulled pork sandwiches, avocado fries, fried chicken, and more home cookin’ than they can handle. Paired with a dessert menu reminiscent of the kinds of once-a-summer treats you find at the CNE, you’re probably going to want to wear stretchy pants when you visit. Stay tuned to their Facebook page for opening night announcements, and the reveal of the much anticipated vegan level ten room.